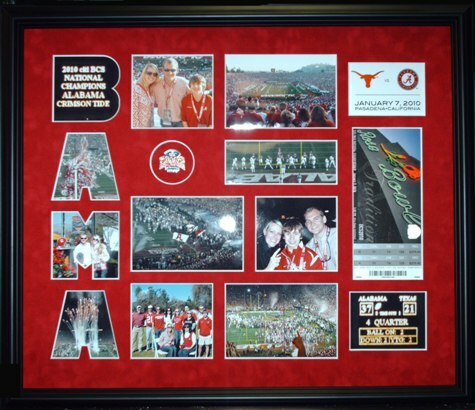 Frame your memories of the 2010 BCS National Championship as Alabama Rolled their way to the 13th National Championship. This is an example of how to frame your memorabilia. Framed exactly like this is $174.95, however many framing options are available. Call 800-425-5778 for pricing and details. Bring in your items and we will help you design the perfect framing and assemble everything for you, or order online and we will send a prepared frame and mat for easy assemble at home with tech support available at 800-425-5778.